Come Monday, before taking a photograph of a police officer, you'll have to mind read whether he or she will suspect the information could be useful to a terrorist. If your mind reading technique is not good, then you could be arrested and end up in the slammer for up to ten years. Photographers - whether amateurs or professionals - are all too commonly stopped and searched on suspicion of conducting hostile reconnaissance. 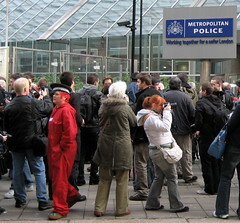 According to Superintendent David Hartshorn, of the Metropolitan Police Public Order Branch, there have been many arrests of photographers but no conviction yet. Since the end of last year, the police have insisted that 'the Terrorism Act 2000 does not prohibit people from taking photographs or digital images', but from next week the police recommends that 'it is advisable that photographers are careful when taking photographs of police officers'. 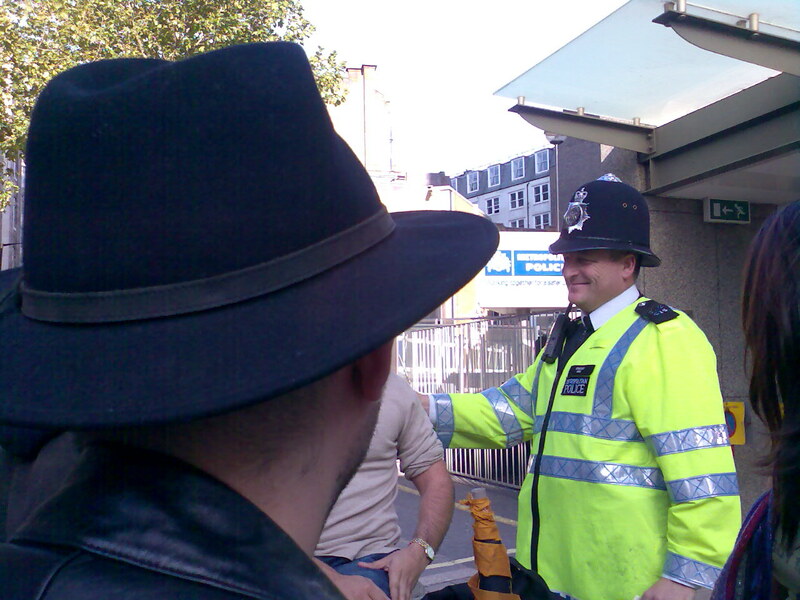 (1) A person commits an offence who— (a) elicits or attempts to elicit information about an individual who is or has been— (i) a member of Her Majesty's forces, (ii) a member of any of the intelligence services, or (iii) a constable, which is of a kind likely to be useful to a person committing or preparing an act of terrorism, or (b) publishes or communicates any such information. I want to take some photos in public, is it now illegal? There will be places where you have access as a member of the public, but will have to ask permission or may be prevented altogether. These could include stately homes, museums, churches shopping malls, railway stations and council/government buildings. You need to check the situation out on a case by case basis. The country is in a heightened state of alert (and will be for many years) because of potential terrorist attacks. So called 'soft targets' are particularly vulnerable. Security staff, the general public and police are much more aware of anyone taking photographs and you may be approached by someone, such as the police, when you are taking photographs near or in potential targets. Generally the police cannot seize the camera or memory card unless you are committing an offence or suspected of terrorist activity. The taking of photographs of an individual without their consent is a civil matter. Taking a photo of a person where they can reasonably expect privacy could be a breach of privacy laws. The other issue to consider is what you plan to do with the photograph afterwards. If you intend to publish it in any way (on the internet, in a book or at a gallery) then you would need the person's permission. From Monday 16th February 2009 there is a new offence concerning eliciting information about members of armed forces, police officers and intelligence services which is likely to be useful to a person committing or preparing an act of terrorism, or publishes or communicates information of that kind. does not state that the person who gets the information has to use the information for terrorism purposes, just that the information is likely to be useful to a terrorist. There is a defence of reasonable excuse under this section and it would be for the suspect/defendant to raise this matter. Any photographer may end up on the wrong end of this law. An area likely to be strongly impacted is documenting dissent or any behaviour the police is not keen to be witnessed and reported. And this law is not limited to photographers. First published on 2009-02-14; last updated on 2009-02-22.